Al has been providing professional racquet stringing for over 37 years. 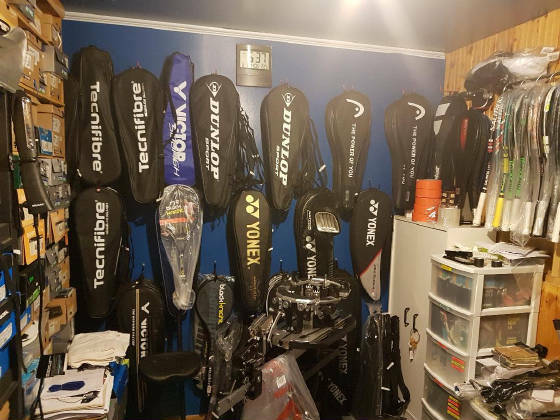 He restrings racquets for squash, tennis, badminton, and racquetball. Our service is based in Northwestern Ontario, but we have been servicing well outside the area for years. Racquets can be shipped to us, we restring and return them via mail, courrier, or however you request. We also sell quality products from many of the top names in all racquet sports. On this site you will find pictures and information on different lines we carry. Due to our limited web space, we only show a few available items from each line. For better pictures or to see more merchandise you can visit the manufacturers website. This link can be found at the bottom of each page. If you are interested in something on that site, you can order it through us. Al's Racquet Stringing also does institutional, and quantity rates. If you want to send in an inquiry or place an order, visit our "Contact Us" page, and we will reply with the price or other information. Please note that all prices shown are in Canadian funds. Al adds new items for the clearance page weekly. Please check back often for the best prices and current items to be listed. If you find a better price somewhere else please let me know and I will try to match it. Customers that purchase their racquet frames from us receive a 10% discount on stringing services. Receive an extra 10% discount on Stormtech clothing orders of $300 or more. Club discounts on Lacrosse. Please request items through our "Contact Us" link, and we will let you know which items we currently have in stock. If requesting in person, please mention this web site to receive your discount and our special low web prices.